Courtney Walsh is a novelist, artist, theatre director, and playwright. Just Let Go is her eighth inspirational romance novel. 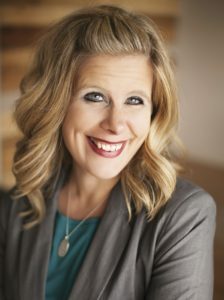 Her debut, A Sweethaven Summer, hit the New York Times and USA Today e-book bestseller lists and was an American Christian Fiction Writers Carol Award finalist. Courtney lives in Illinois with her husband and their three children. I suppose I’ve always been a writer—at least my dad would say so. I didn’t realize it until I went off to college. At the time, I wanted to study theatre, and he told me, “You should do something with your writing.” To which I replied, “What writing?” Isn’t it amazing how parents know things about their kids that they have yet to learn? I majored in journalism and theatre and continued writing scripts and articles all through college. I think I process by writing things down, so it’s something I’ve always done. Just as all good novels include a plot twist, the Author and Creator of our lives often writes in a twistthat ultimately blesses us more than our original plan. Have you ever experienced such a “Divine Detour”? Let’s talk about your new book, Just Let Go (Tyndale House, June 2018). Please tell us about it. 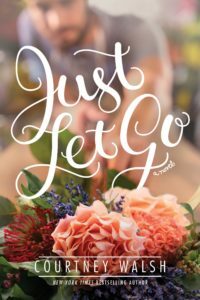 Just Let Go is an opposites-attract story where the life of a small-town, risk-averse flower shop owner is turned on its ear by an adrenaline-junkie Olympic skier. It’s set in Harbor Pointe, Michigan, a fictional cottage town with cotton candy–colored buildings lining Main Street, quirky characters, and a beautiful red lighthouse on the beach. It’s an opposites-attract love story about letting go, learning to accept an apology you never got, forgiveness, and figuring out who you really are. Those who create usually tap into a personal “toolbox” of elements to define their style. For example, a painter might use color, light, or shadows in a certain way to “sign” his work. A musician might use syncopation, key changes, or vocal intonation to set herself apart. What two or three elements most define who you are as a storyteller? Depth—I write “kissing books,” but they aren’t just “kissing books.” I really like to add depth to my characters and their journeys. I feel like it’s important that both my hero and heroine are on their own paths—and yes, they will definitely converge (hence the kissing . . .), but I like to create characters who are whole and independent on their own. Dialogue—I’ve done a lot of writing for the stage, so dialogue is my absolute favorite thing to write. I think it defines my writing, and I often find my characters through dialogue. Small towns—I’m not saying I’ll never set a story in the city (I sure do love NYC! ), but small towns have my heart. I’m from a small town, and there’s something so inviting about a simple lifestyle in today’s busy, busy world, so I don’t see myself moving away from that anytime soon! Oh, me + food = heartache. I have a lot of food allergies and sensitivities, but if I were able to eat anything, my favorite would most likely be ice cream (cookie dough!). I have found a really good dairy-free Häagen-Dazs ice cream, so when I want to splurge, that’s going to be my go-to. YUM! What is your favorite Bible passage or story? I have always loved the story of Esther. Even as a girl, I could see there was something so strong about her. I admired her bravery and just knew if God had chosen me for that task, the outcome may have been very different—I don’t know if I could’ve done all that she did. In the story that is your life, are you the strong female lead, the girl next door, the mysterious woman behind dark glasses, the superheroine, or the little girl trying to walk in high heels? Oooh, another fun question. Gosh, this one is hard because I feel like I wear so many hats. Sometimes life requires me to be the strong female lead, and I can do that, but I have to say I much prefer my role as the girl next door. That’s much more “me” and where I’m the most comfortable! Thanks, Courtney! It’s nice to have you as a guest at Divine Detour. For more information about Courtney, visit her website and blog and on Facebook, Twitter, Pinterest and Instagram.